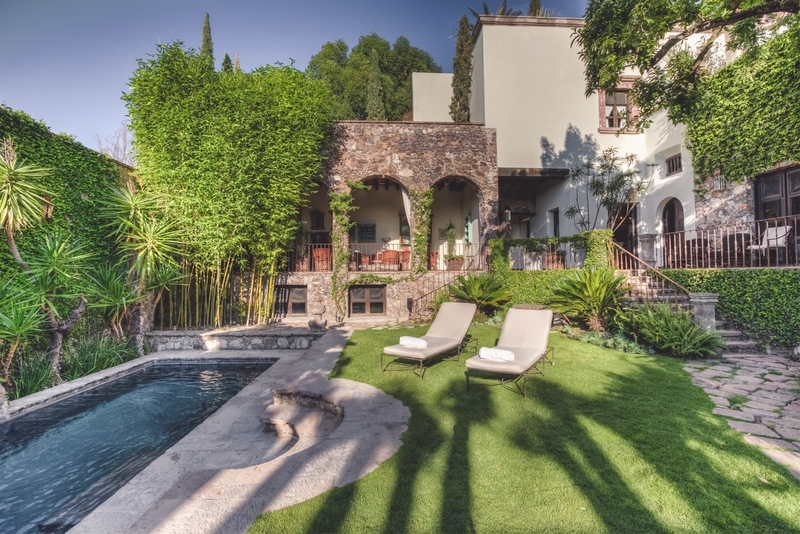 This spectacular home is located just a few blocks from the Jardin (the Central Square). From the street it appears to be a traditional colonial casa, but inside you will discover a luxurious and spacious home, sure to please even the most discerning guest. As you enter the house, you come upon the central courtyard lined with stone columns and tall archways. An overflowing fountain, which appears to be floating in a small pool, is the focal point, surrounded by rich landscaping. The formal living room, dining room, kitchen, master bedroom, and three other guest bedrooms are accessed from this courtyard. 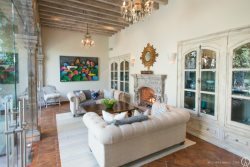 The home's decor is a tasteful blend of carefully selected antiques, hand crafted furniture from the region, and striking artwork and tapestries. All of the rooms have raised ceilings and exposed wooden beams. The lovely dining room accommodates 12 guests and has French doors, which can remain open to enjoy the warm San Miguel climate. This is true for many of the rooms in the house, such as the living room, which has several sets of French doors, as well as, a large gas fireplace and a desk - that is concealed in what appears to be an over sized armoire. Just off the living room you enter the den, which has a workspace area with a desk, a gas fireplace and a couch with over sized chairs to enjoy the 52"flat panel TV. The controls for the home's multi-room sound system are also found here in the entertainment armoire. The well equipped kitchen and breakfast nook can easily accommodate 10 guests for casual dining or a cooking demonstration by a local chef. With its large center island and VIKING appliances, it is certainly a cook's kitchen. A walkway continues on between the living room and the kitchen leading you to the beautifully landscaped garden, wading pool with fountain and a large covered terrace. There are lounge chairs on the grass just before the pool and two sitting areas on the covered terrace that share a gas fireplace. A bar-b-que grill and bar complete the terrace for outdoor entertaining. All of the six bedrooms are generous in proportion and amenities. Four post king beds are in all, but one of the rooms. Two guest rooms are on the second floor of the house, one of these has twin beds (that can convert to a king). Every room has a sitting area, gas fireplace, phone (with instructions cards), and ensuite bathrooms with dual sinks. The guest rooms vary, as some have a combination bath/shower, and others just have a shower. The third floor is a rooftop terrace with a garden and amazing views of the Parroquia and the center of San Miguel. There is WiFi in the den, living room, and the back garden. Purified water throughout the house. There is a tip for the staff of $1000 pesos per bedroom.